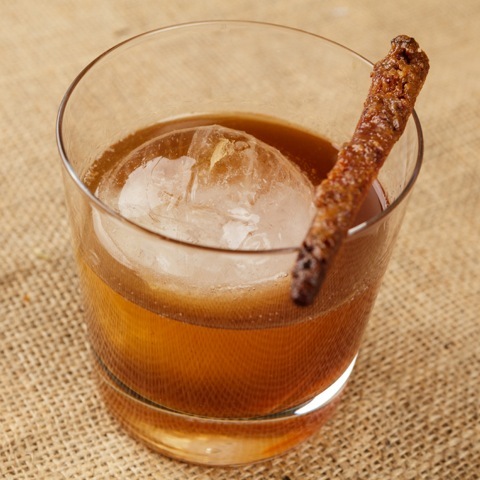 Candied Carolina Pride bacon and homemade simple syrup give this traditional “Old Fashioned” a holiday twist. Make candied bacon. Preheat oven to 400°F. Line a rimmed baking sheet with foil. Place a wire rack on baking sheet. Combine pecans, brown sugar, maple syrup and cranberries in food processor. 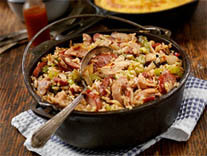 Pulse to combine or until mixture is moist and pecans are finely ground. Then add salt, pepper and cayenne pepper and pulse a few more times. Dredge bacon through mixture until coated. Arrange bacon on wire rack. Bake 20 minutes or until bacon has reached your desired level of crispness. Check periodically, because bacon tends to burn at the ends. Cool and slice into thin strips. Make simple syrup. Combine brown sugar and water in small saucepan. Bring to a boil. Stir often until all sugar has dissolved. Let cool and pour syrup into small bottle. Store in refrigerator; it will last a few weeks. Make drink. Combine cooked bacon pieces, 3 tsp. simple syrup and bitters in cocktail shaker. Add ice and shake about a dozen times. Double-strain the mixture into a lowball glass with fresh ice and remove bacon pieces. Add bourbon and stir until cold. Squeeze orange peel over drink and drop peel into glass. Garnish with candied bacon strips.